The results of the SLAC T-510 experiment have been accepted for publication in PRL. Have a look at the arXiv or the journal webpage. On the vast plain known as the Pampa Amarilla (yellow prairie) in western Argentina, the Pierre Auger Observatory is studying the highest-energy particles in the Universe, which hit the Earth from all directions, so-called cosmic rays. Cosmic rays with low to moderate energies are well understood, while those with extremely high energies remain highly mysterious. By detecting and studying these rare particles, the Pierre Auger Observatory is tackling the enigmas of their origin and existence. 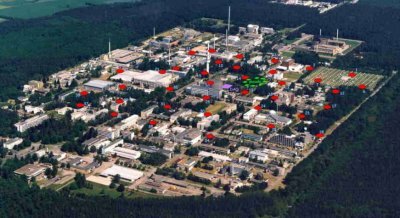 This article provides a short description of the LOPES experiment at Campus North of the Karlsruhe Institute of Technology including links to the LOPES Project webpage. Cosmic rays are particles (mostly atomic nuclei) with energies above 1010 eV (sometimes even beyond 1020 eV) that are accelerated in highly energetic cosmic phenomena like supernovae, black hole jets … The exact processes in which they are produced are unknown, but they can be detected through their interaction with particles in the atmosphere. This article, adapted from the webpage of the KASCADE-Grande Experiment provides information and additional resources regarding the KASCADE-Grande experiment at Forschungszentrum Karlsruhe. KASCADE-Grande is an extensive air shower experiment array to study the cosmic ray primary composition and the hadronic interactions in the energy range E0=1016-1018eV. The experiment is situated on site of the Forschungszentrum Karlsruhe. It measures simultaneously the electromagnetic, muonic and hadronic componenets of extensive air showers of cosmic rays. SLAC T-510 is an experiment to measure radio frequency emission from cascades of secondary particles in a dense medium in the presence of a magnetic field. The main goal of the experiment is to validate the models used to study the radio emission from extensive air showers caused by ultra-high energy cosmic rays in the earth’s atmosphere. T-510 uses a 5 GeV electron beam to create secondary cascades in a 4 m long high-density polyethylene target placed in a magnetic field up to 1000G. The radio frequency emission is measured in horizontal and vertical polarizations by both UHF and VHF antenna arrays placed at different locations with respect to the Cherenkov angle. The Tunka Radio Extension (Tunka-Rex) is an array of 25 radio antenna stations at the Tunka-133 experiment, covering an area of approximately 1 km². While Tunka-133 measures the Cherenkov light of air showers in the energy range up to 1 EeV, Tunka-Rex measures the radio emission of the same air showers. Tunka-Rex started operation on 8 October 2012. Thus, Tunka is currently the world-wide unique place for performing Chrenkov-Radio hybrid measurements of ultra-high energy cosmic rays.